For the last few years I've been hearing raw foodists and fruit lovers rave about the Chanthaburi Durian Festival in Thailand. Thailand is pretty much the fruit capital of the world already, but Chanthaburi's festival was supposed to be the crème de la crème. Since I was already in Thailand, I thought I'd head down south and check out what everyone was talking about, and I wasn't disappointed. Since so many of you have been asking me how it was, I wrote up a review and made a video, which you can find here. Want An Inspiring Raw Food Magazine? Not long after I started considering a raw food diet as a possible solution to my colitis and other health problems, I stumbled on an inspiring magazine which immediately earned my respect. 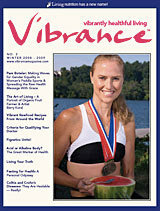 Vibrance Magazine is the work of David Klein, a long-term raw foodist who promotes a healthy fruit-based raw food diet without the scare tactics promoting profitable supplements and superfoods you find in many publications. David's articles highlight inspiring raw food success stories, talk about the environmental benefits of the diet, give great recipes and cover many other topics. I've written up a review of Vibrance, which you can read here. 1) Can you eat a locally-grown raw food diet? Do raw diets hurt the planet? 2) What kind of water should you buy? Should You Buy Water At All? What's The Deal With Durian? Increasingly, a lot of raw foodists seem to be obsessed with durian, seeking the stuff out like it's manna from heaven and gorging themselves on it almost exclusively for months at a time. I'm fond of it myself, but I realize it's something of a double edged sword. So should we be eating durian? Check out my article here.